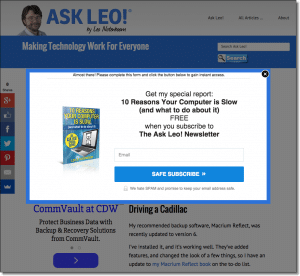 The popup box that appears a short time after you first visit Ask Leo! should only appear every few months. If more, it's probably cookie related. I am already a subscribed to your newsletter, but I keep getting a pop-up asking me to subscribe. This ‘nagging’ action is a fairly recent problem. This is beginning to annoy me and I would appreciate knowing how to stop this from occurring. First, thanks for subscribing, I appreciate it. Second, I’m sorry that my site is annoying you. It’s not supposed to. The fact that you’re subscribed actually has nothing to do with whether or not you see that popup. The website doesn’t know who you are, and is completely unrelated in technology to the newsletter. It certainly doesn’t “know” whether or not you’re subscribed. That should be shown only once a day. Both limit themselves by instructing your web browser to put a cookie on your machine so that it knows “oh, you’ve seen this already, I don’t need to bug you”. So why is it bugging you anyway? You’re opening multiple tabs or windows at once before the cookies have been set. Each tab then thinks it’s the first for the day. You have cookies disabled. Without cookies, I have no way to keep track of the fact that you’ve seen the popup before. Your internet security software is blocking cookies. Same problem: without cookies, I don’t know not to bug you. If you can, add an exception for “askleo.com”, “ask-leo.com”, “leadpages.net”, “sumome.com” and “aweber.com”. AWeber is my newsletter email provider, LeadPages.net is a provider of some of the newsletter subscription tools I use, and Sumome provides the social media share buttons as well as the bottom slider. You’re regularly clearing your cookies – either manually or through some automated process. This causes my site to “forget” that you’d visited before. You’re using a different browser on each visit. OK, probably not each visit, but since each browser keeps it’s own list of cookies, the first time you visit the site in, say, Internet Explorer, you’ll still see the pop-up once even though you’ve visited before using FireFox. You’re using a different machine. Same issue as the previous point – cookies are kept separately on each machine. 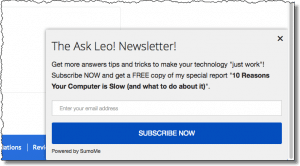 The newsletter subscription pop-ups are actually vital to Ask Leo!’s survival. I have run without it, and the results were not pretty. It, like some amount of advertising, are what helps pay the bills, and keep Ask Leo! free and vibrant.